I was very honored that Georgia Cates agreed to doing an interview with our site. 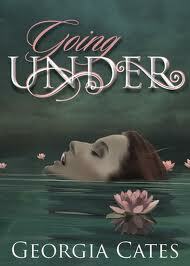 On top of that, I was so happy that she agreed to do an eBook giveaway of her book Going Under. I have recently read this book and fell in love with it. Georgia Cates is a remarkable author and the book is a quick and fantastic read. You can catch up on her latest information on her site and can follow her on Twitter: @GeorgiaCates. The giveaway is simple: 1 - follow our site and 2 - leave your email in the comment section and I will randomly choose a winner on Tuesday May 15, 2012. When did you realize that you wanted to be an author? I always enjoyed writing and felt like I was good at it. Did I think I could make a living at it? No. I needed more stability in my life than to be a struggling writer, so I spent the last 14 years as a labor and delivery nurse. It’s been fun and it’s been an absolute privilege to be with mothers while they give birth to their children, but it’s time for me to do this for me. I didn’t decide I was going to professionally write until about 2 years ago. Boy, I wrestled with my first book for about a year before I decided it was time to stop fooling around and do it! Best decision I ever made. What is the best part of being an author, to you? Because I’m Independent, it’s the freedom I have over what, when, where, how and why I write. I typically write in my recliner while I’m wearing my comfies. If I want to sleep in, I sleep in. I’m able to adjust my writing around my life instead adjusting my life around my work schedule at the hospital. Writing never causes me to miss anything my kids do. I love that and my kids do, too. Did you base your main characters Jessie and Claire off of someone you know or just let them evolve? There’s probably a lot of me in Claire. I don’t mean the privileged part because I certainly didn’t grow up like her. I mean the desire to please everyone and do what they think I should do. I’m a people pleaser and I hate that about myself. I always wanted the bad boy and I snuck around with one from time to time, but I always gravitated back toward that boy that everyone thought I should be with. Jessie isn’t based on a particular person, but a general idea of what I thought constituted a bad boy in the eyes of a girl like Claire. What was the best part about writing Going Under? I think I enjoyed coming up with the snarky things Claire and Payton would say. There are so many things I went back tamed down because I didn't want them to come across as too crude, but OMG...they were so funny. Will we see any more Jessie and Claire in the future? I never want to rule anything out, but I don’t see Jessie and Claire getting a second book. However...they will be seen again when I write Payton Archer’s story. There’s more information about that in the answer to the next question. Do you have any upcoming projects coming up? Do I? Oh, yeah! Right now, I’m wrapping up Blood Jewel, Book 2 in The Vampire Agape Series. The moment it is out of my hands, I will begin writing Payton Archer’s book. I can not wait. She is not meek like Claire and she is going to be so much fun. It’s going to be difficult to not get carried away with that girl. I know everyone didn’t, but I absolutely loved her. She’s my kind of girl. It’s going to take a tough guy to handle her, I’m afraid. Congrats on taking the plunge and realizing your dream! I cannot wait to read your book!